We have wonderful gifts for the discriminating butterfly lover. Selections range from small erasers to 12-foot kites, original artwork, T-shirts, sweatshirts, notebooks, educational books, puzzles, playing cards, inflatable chairs, mirrors, jewelry, candles, scarves, cards, magnets and many more items. 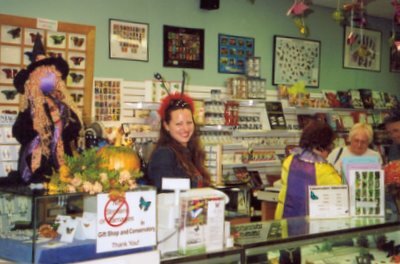 Every item that we stock is related to our butterfly theme in some way. Strollers are not allowed in our Conservatory or Gift Shop, due to fire code compliance issues. Thank you for your understanding. A limited number of posters are available in our Gift Shop. Kjell (pronounced shell) Sandved was an exchange student working in the Smithsonian when he discovered a perfect "F" in the wing of a butterfly display. He spent the next 24 years traveling to over 30 countries world-wide searching for the 26 letters of the alphabet in the wings of butterflies and moths. During his search, he also found numbers, smiley faces and hearts. 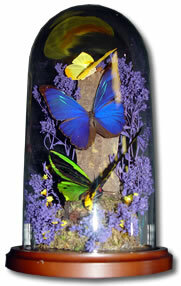 Our Butterfly Domes are hand made by curator Fred Gagnon from naturally expired butterflies. The domes come in three sizes, small, medium and large. Pricing begins at $49.00. Because the domes are so fragile, we can not ship them.